First Keith Generation: Marshall Dexter Keith born 1852, married Nellie Page and had one child Harry. Marshall died in July, 1928. Second Generation: Harry Page Keith born 1882, married Edith Brubaker in 1907. Had two children, Marshall William Keith and Harold (bud)Page Keith. Harry died in 1966 and Edith in 1982. Third Generation: Harold(bud) Page Keith married Clara had two sons Harold and David. Harold (bud) died 1945. Marshall William Keith married Helen Roehm in 1934 and had two children, Karen and Marshall John Keith. Fourth Generation: Marshall John Keith married Barbara Hogan in 1956 and had three children: Marshall Paul Keith, Colleen Keith, and Michael Page Keith. Barbara died in 1969 and Marshall John died in 2004. Karen Keith Markham married John Markham in 1959 and have five children. Fifth Generation: Karen and John Markham five children with their grandchildren all live in Virginia and Maryland. Marshall Paul Keith lives in Crandon, Colleen and Michael Page Keith live in Minneapolis and none have children. 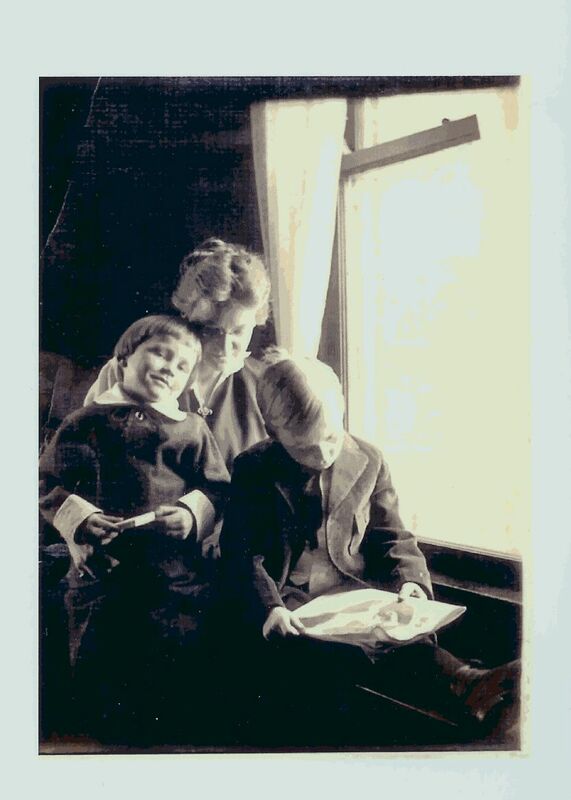 1916 - Picture of Edith Keith with sons Harold(Bud) on her lap and Marshall W. This was printed from a glass negative. In 1891, The Page and Landeck Lumber Company bought a huge tract of hardwood timberlands near Crandon, but they were unable to utilize the resource until the C & NW Railroad built a spur line from Pelican Lake. By 1902, a huge sawmill owned by Page and Landeck (the name was later changed to the Keith & Hiles Lumber Company, and that is how many people refer to the early mill) was sawing lumber on Clear Lake on Crandon's north side. Logging camps were built, a company train hauled logs to the mill, the C & NW hauled lumber to market, and a hose of other industries that utilized hardwood lumber grew in Crandon. This line ran in an easterly direction out of Crandon. It was begun in 1905 by Boyd-McAlpine Lumber Company. Later that same year Page & Landeck Lumber Company bought the line. In 1908 Keith & Hiles became the new operator. Marshall D. Keith was a very active participant in the building of the Wisconsin & Northern Railroad, which is the present WC line between Neenah and Argonne. In 1907 the W & N constructed its line from Argonne and Crandon. Construction on the line south from Crandon began in 1913, much at the insistence of Keith who owned the timberlands south of there. Keith and Hiles' railroad operations were moved south in 1913 to Keith siding about 5 miles south of Crandon. Keith and Hiles operated there until 1918. *Excerpt from a report on old logging railways. The Bungalow - Early 1940's.